So, copper, bronze and rose gold seem to be a very popular colour right now, and I'm giving in to this trend 1000%. My colour scheme for my bedroom and when I move out (Looking for apartments at the moment, eek excited!) is matte black, white and copper. Super chic, right? 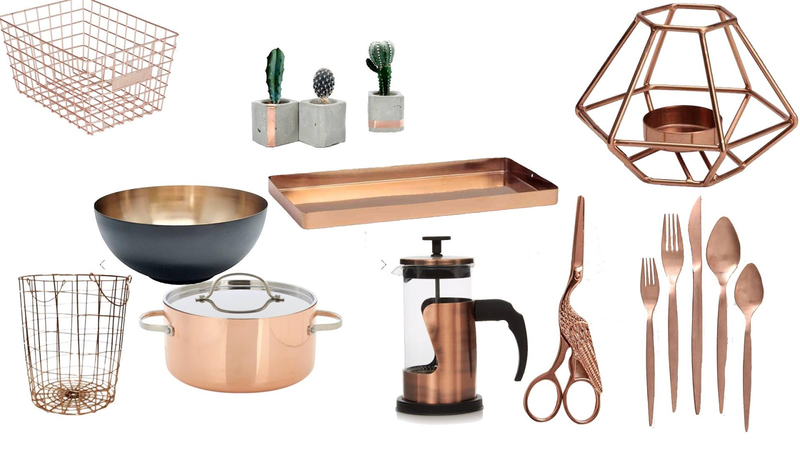 Aside from what I've already purchased, check out my sparkly copper wish list below! ... Ok girl, that's a lot of coppery goodness and I've put myself on a spending ban momentarily, but these things are just too damn gorgeous! Those scissors are my favourite piece of this wish list I think, the detail is incredible, and they're so unique! I feel like I wouldn't want to use them for everyday use and have them to just sit and look pretty, is that craaazy? I feel like my mother would call me crazy and tell me to be practical, but LOOK AT THEM! I think copper is going to be one of my favourite colours for a very long time, and it looks like its here to stay in all of the shops, too! Do you like this trend? What's your favourite thing on this wish list? Have you brought anything copper lately? Let me know!